It is FINALLY Friday! I don't know why but this week just seemed to telescope out until it felt like about a month! This morning I took my big, ballooning blisters out for a walk. Well . . . let's just say things didn't work out too well for us. In fact, the blisters went from big, ballooning blisters into big, BLEEDING blisters. 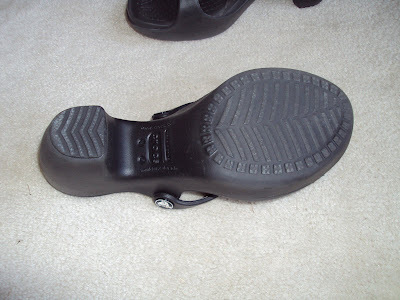 In about a block or so from my house, I noticed that the pain was increasing and looked at my heels . . .I then proceeded to take off my sneakers and walk back home in my socks. That must have been a sight! Oh well! At least I don't have to pop my blisters now! Let's see . . . what else is going on? Oh - "L," the person I am temping for, came into work yesterday. She is doing pretty well and is going to try to start coming in to work for an hour or so a couple of times a week. That will be good. Of course that means I need to make sure that I leave work for her to do. I have sort of gotten into a "groove" at work and get most stuff done pretty quickly now. It will actually be good that L is coming in next week since Hubby and I are taking our semi-annual trip up north next week. The four speech pathologists were a little worried about being "on their own" for a week and so L coming in will help that a bit. 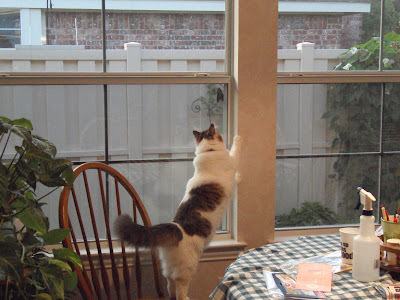 Yesterday I went to talk to my neighbor, "C" about taking care of the cats while we are gone. I found out that on the very first day of school - she teaches Kindergarten - she tripped over a student chair and sprained her ankle. The school made her leave school to see a doctor and she ended up with crutches and a brace. Doesn't that sound fun? She just got the brace off yesterday and is so happy that she doesn't have to mess with it any more! Today I am heading to the college to spend some quality time in the lab since I will be missing my practice time next week. AND we have an assignment due on the Wednesday I get back. Fun, fun! When I get home I "get" to start all the pre-trip stuff - laundry, watering plants, cleaning the cat fountain, etc. Want to come and help? Voice Update: I got a nice massage from Holly yesterday and things feel so much better now! I just have to remember to do massage while visiting the folks! Oh Bother! Big, Ballooning Blisters! First of all, thank you for the supportive comments I got on my fractious post. I know this will pass . . . . eventually! Well, I made it through another night of class. Actually, it was a pretty good class - if you could call it that. The normal class size of seven was reduced to only four and so Henry, our teacher, decided that we should cut class short and work on our first assignment in the lab so . . . that is what we did. The four of us who were in class plus one woman who showed up at about seven (the class starts at six!) worked in the interpreting lab on our first assignment. The assignment is simple on the surface - watch a story told by a Deaf person in ASL. Practice voicing for the story (that is translating what is said in ASL into spoken English) and also practice signing what your classmates are voicing. However, once we got into the story it got a bit more complex. We had some issues figuring out what the person was saying in her story. At one point we were almost ready to just all make up a word and stick with it. We figured that if we all said the same thing - what could Henry do? Then, we actually figured out what the person was saying. We did have a nice laugh over our "invented" version though. My only anxiety now is that I will be missing a week of classes next week when I travel to Ohio to visit family. The assignment will be due when I get back! Not too much time to practice in that time frame! Oh well! What is that? Oh, you want to know about the title? Here is the story. For class we are expected to dress like a professional interpreter - nice, solid colors , etc. 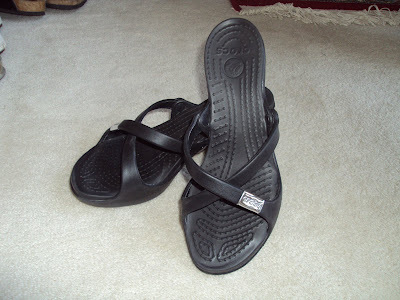 Well, my normal summer footwear option is Birkenstock sandals. Henry said that they were not appropriate. Drats! However, I do own other shoes so . . . I dragged a pair out of the closet and decided to wear them for class. These are shoes that I bought right before I had to stop teaching so I actually never wore them to teach in. In fact, I haven't worn them much at all! I tested the shoes out around the house on Tuesday night and it seemed like they were going to work out. I would put them on right before class and make it through the two hours or so of class with no problem! Well - there was a problem! I have thin heels (the only part of my body which can make that claim) and, apparently, the shoes have wide heels. By the time I had walked into the building from the parking lot I had developed nice, big blisters! In fact, they were so bad that I spent the rest of the evening barefooted. Yes, barefooted in that nasty, dirty college. Yuck! At least Henry didn't say anything - thank goodness! I guess I get to go back to the drawing board - so to speak - with the whole shoe issue. *sigh* Isn't that just how my luck is running these days? Voice Update: A big stressed right now - there has been a lot of phone work at work this week. However, it is doing pretty well - a few breaks now and again but hardly noticeable! That's It! I Am Just Going to Be Fractious! Is it too early to be overwhelmed? I just started classes on Monday and already I feel like I am falling into a giant pit. I haven't even started any of the assignments and I already feel like I am behind! What is up with that? AND - I am tired! This morning I sat down on the entryway rug to put on my socks so I could walk and . . . I fell asleep! What is up with that?? AND - I feel like my blog is stalled. No one - except my handful of very loyal readers (you know who you are!) - seems to be reading or caring if I write or not. Of course, I didn't start this blog to really get a huge audience but . . . what is up with that??? AND - I am getting a new zit right next to my bottom lip. It hurts and feels like it is the size of Jupiter. What is up with that???? That is it! I have had it! I am just going to be fractious today. Voice Update: Surprisingly, it is doing well. I have been swamped with phone calls at work (what is up with THAT?????) but so far - so good! Well, I survived my first day of work and classes. A couple (literally two) people I was close to in ASL 3 are in my ASL 4 class so I am happy! I do have to say that this class looks like a lot of work and I am just a tiny bit apprehensive about missing a week of classes to go to Ohio to visit my relatives but . . . I am sure I will survive! Miss Cleo now is stitch free and Skor has started on yet another antibiotic regime even though Hubby couldn't get any meds down him yesterday morning and had to wait until I came home to complete that task. We still aren't sure what was going on with Miss Cleo's tumor - the pathology came back "undetermined." Don't you love that? The vet said that if it grew back we may be looking at something cancerous (heaven forbid!) so I guess we just get to wait and see what happens! Have I ever mentioned that on Tuesdays iTunes puts out a new single of the week which can be downloaded free? It is fun - all different genres, some good and some just so-so, but something different each week! I look forward to Tuesdays and a new song! Either it is my addiction to iTunes, my love of music, or my love of free stuff! Speaking of iTunes, there are a couple of podcasts that I have been listening to lately which I thought I would mention briefly. Lately I have been searching for a better way to meditate on the Bible and to deal with devotions. I have been getting The Daily Bread for many years and really like their daily devotions but . . . I just don't seem to make the time each day to read them. So . . . I checked out podcasts - after all, there are podcasts and pretty much everything these days. I found three podcasts (well, I found a LOT but narrowed down my focus to three!) which I want to let you know about. First, is PodBible - Bible in a Year. This is "normal" people from New Zealand reading from the Bible. Once you get used to the accent (which is neat! ), it is a good way to listen to the Bible. Once in a while a reader gets tongue tied and that is a bit distracting but on the whole - this podcast is a super way to get closer to the Bible and to "read" it in a year. Next is EarlyLight Daily Devotional. This is a short podcast which starts with a theme each day such as discouragement, jealousy, success, etc. Then the speaker ties the theme in with a Bible passage and a short message. I have found these to be very though provoking and enjoyable. The speaker is very professional and the topics are well planned and relevant to daily life. This is the podcast I start my day with each morning. Finally, there is Today in the Word Daily Devotional. This is produced by the Moody Institute (I think that is right). This podcast begins with a Bible reading and then a devotional relating to the reading. While I think the podcast is well done and the devotionals are thought provoking, there are times when I think the connection between the passage, the devotional, and daily life is just a bit tenuous. I regularly listen but it isn't my first choice. If you are interested in daily devotionals or daily Bible readings but have never found the time - check out these podcasts. You can listen on the go or while exercising - which is my preference - and get your day started on the right foot. Voice Update: Doing well even though I did WAY too much talking on the phone yesterday. In fact, I did so much phone work that Jean, on the therapists actually stopped in the office and told me that I HAD to take a break to help my voice! I am hoping to get a massage today. We will see. Today is the last day that we will have TWO invalids in our house! Yeah! 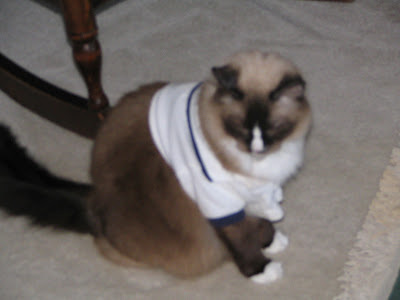 Today Miss Cleo gets her stitches out so we will be able to retire the polo shirt for the time being. It has served its purpose well. You may have noticed in the first picture that Skor is now a conehead . . . .AGAIN! Yes, that is right. Skor has been coned. We keep thinking that the experience of having his feet cleaned and wearing a cone will keep him from messing with whatever he messes with to cut his feet (we still haven't figured out what he is messing with despite an all out hunt!). However . . . it doesn't seem to be working too well yet! 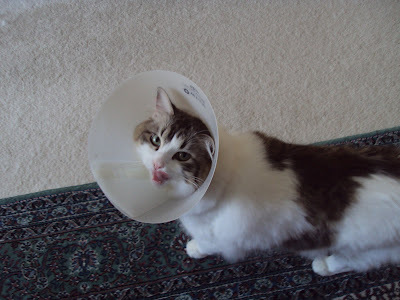 Luckily, Skor doesn't mind the cone too much. Not that he LIKES it - he just doesn't run like a mad kitty to try to get it off! 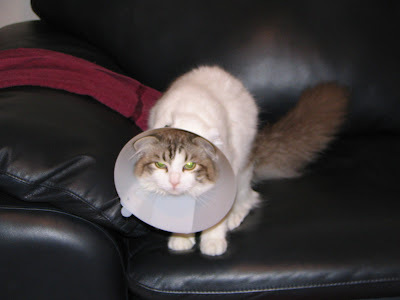 Miss Cleo, on the other hand, doesn't particularly care for the cone. Even if it is on Skor. At least she isn't running away from him any more - that really hurt his feelings! Well, school starts for the kiddos in our neck of the woods today. School also starts for me today! After work - and "early work day-" I will head to college for the beginning of ASL 4. It should be interesting. I still get just a little nervous about new classes even after all these years! One of my biggest issues this semester is going to be food. I leave for work on Monday and Wednesday by 10:15. That means that while I have had breakfast, I haven't had lunch. Then I go from work directly to school - missing dinner. I will take healthy snacks to munch on at work but I feel like I should eat something more substantial before class. If I don't I think my concentration will be a bit . . . "off!" Now, trying to think of what to eat before class. I could take something. There is a refrigerator at work I could stash stuff in while I am there. However, what exactly do I take? I could buy something on my way to school. However, that would probably be fast food and I would like something a BIT healthier! What a problem! Voice Update: Doing well. Susan is off this week - in California visiting with her new grandson - so I won't be getting my normal massages. Should be interesting! I am both physically and mentally tired so I am living vicariously today. 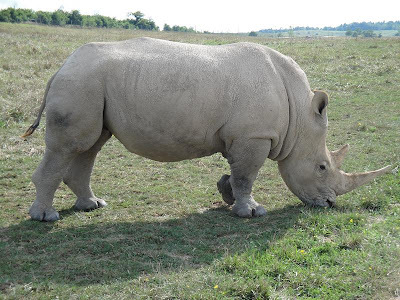 These pictures are from The Wilds in Cumberland, Ohio. I guess The Wilds is a safari park. My parents and my uncle went on a trip there yesterday and shared these pictures with me. Apparently you get on a bus (either open air or closed in) and tour the property to see all of the animals on the grounds. My mom told me that they saw a herd of 5 giraffes running down the road. Imagine that! Cool,huh? 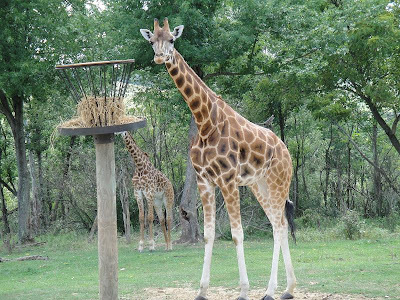 Mom said that it was a fun experience - of course, she and Dad have been on a REAL African safari so this wasn't "quite" the same but it still looks like fun, don't you think? Voice Update: Doing well. The soreness in my neck is finally gone and that makes massaging my neck a LOT easier. I did notice yesterday that I was having some issues with those darn, infernal hs again! Rats! I know that in the past I have said that I love storms and I still stand by that statement. However, what I do not like is waking up in the middle of the night because of a storm and then not being able to go back to sleep. That, my friends, is NOT a good thing! It didn't help that Skor noticed I was awake (at 1:30 A.M.) and decided that MUST mean I was getting up to feed him soon. He checked in on me periodically by jumping on my stomach and then nestling next to my ear while purring VERY loudly. At least I got to hear it rain. And thunder. 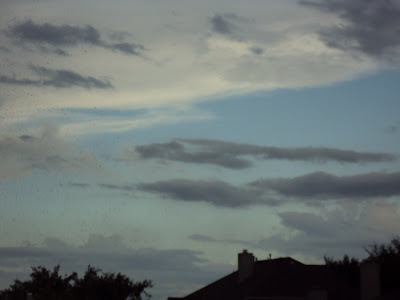 And I got to see the lightning - which at one point reminded me of a strobe light. And then . . . there was this. Hubby's car is in the shop for some minor body work and he has been riding his scooter to work. However, due to the rain this morning and the chance of more later today - I drove him to work. 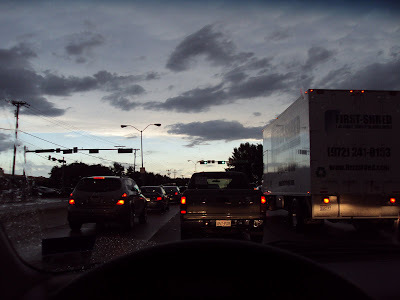 I took this picture and the rest on my way home - when the traffic was much lighter and I was a bit more awake. I will admit that the clouds are pretty impressive. 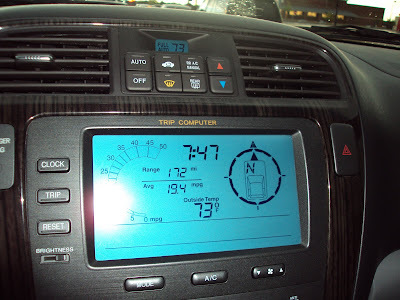 The other thing that was impressive was the temperature. Normally at this time in the morning I am out walking and the temp is already edging towards the low 80s! This morning felt heavenly! Well, it felt heavenly except for the truck that was behind me almost the entire way home and its REALLY bright headlights. 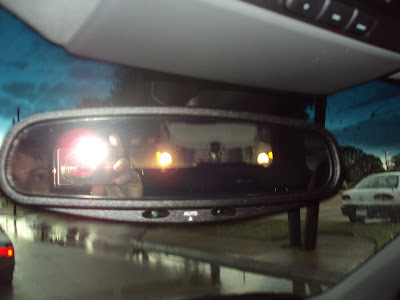 They didn't come out as bright as they really were in the picture but the camera flash did! 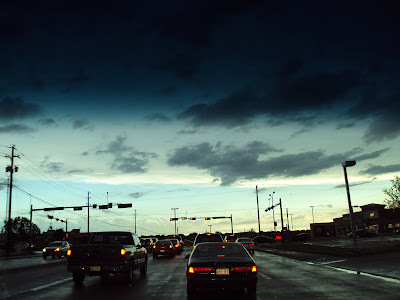 The dark clouds layered over the white clouds just looked so neat. If only there weren't so many poles around to get into the shot! I got this shot in my driveway. It is still pretty dark out for the time of the day but looking out the window as I type this - I notice it is getting much lighter. The best thing? 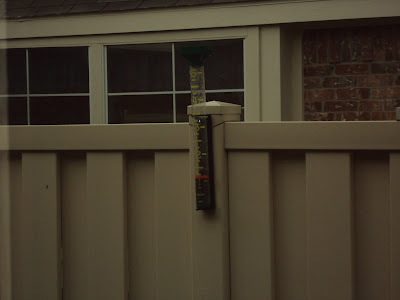 We got an inch and a quarter of rain. I know this is a bad picture but . . . hey - I am still half asleep this morning! 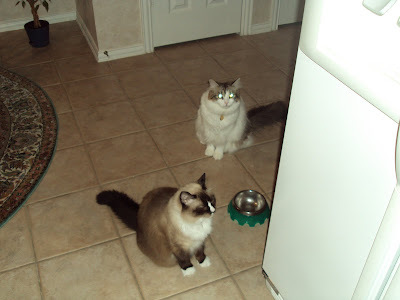 On the kitty front . . . . Miss Cleo and Skor captured a chameleon last night. I think Miss Cleo found it first and laid on it. 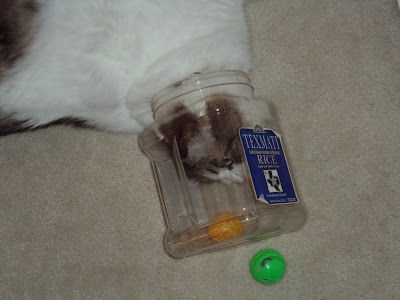 Then Skor noticed she had something and nosed around until Miss Cleo moved and revealed her "prize." It sort of freaked me out because Miss Cleo had obviously taken a little nip out of the poor little guy. Luckily, Hubby came to the rescue and disposed of the critter. 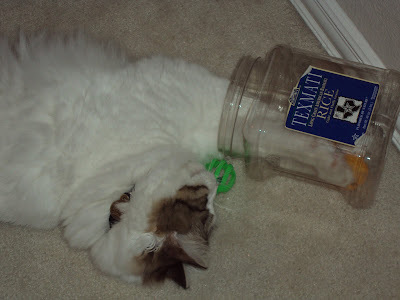 Of course the cats couldn't figure out what had happened to it and spent the next hour looking for the thing! Too funny! Miss Cleo is still in her polo shirt. I am on a quest to get "good" pictures of her in the shirt. I obviously haven't reached that goal yet but . . . I haven't done much about Skor's foot. I am cleaning it and spraying on antibiotics - which he promptly licks off. But, hey! He is still getting it in his system, right? Have I mentioned how much I love my cats lately? No? Gee . . . I wonder why . . .
Also, I am going to have lunch with my friend, Donna, this morning. She has had a rough couple of weeks and is on a medical break from teaching for a week or so. I am looking forward to lunch and catching up. I hope you have a super Friday! Voice Update: I am really too tired to think about it right now but . . . it is still doing really well! First - the good news. Miss Cleo is healing very well and just had her last dose of meds this morning. She is leaving her white polo shirt on and isn't fussing too much. In fact, she actually played last night! Amazing! Do you remember what caused this? Right! Skor managed to cut two of his feet and we had to keep him from getting at them so they would heal. The whole process involved meds twice a day, cleaning the feet twice a day, and putting antibiotic on the feet twice a day - all of which Skor vehemently protested. He didn't enjoy the cone too much and eventually "graduated" to a baby sock for the last part of his healing. About three or four weeks ago he did it again. He managed to slice the pad of his right front foot. This caused the pad to swell to an amazing size. Once more he got "coned" while we did the routine of meds twice a day, cleaning the foot twice a day, and antibiotics on the foot twice a day. Skor still managed to protest the meds and the the ministrations. 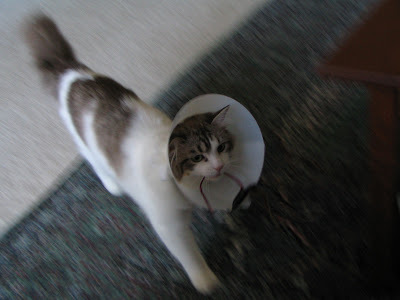 However, luckily, he seemed to adjust to the cone pretty darn well. And then - we were done. The foot was healed and the cone was retired once more to the linen closet. Hubby and I breathed a sigh of relief because Miss Cleo is much easier to give meds to than Skor and she was only going to need to be "shirted" for 10 days. The end of the kitty troubles were in sight. On Monday of next week we (which probably means me) will take Miss Cleo to have her stitches out and then we can retire the polo shirt along with the cone. Yesterday, before I headed to work, I noticed the Skor was really doing a number on his LEFT front foot - more than normal. I made a mental note to check it out when I got home. Which I did. He has a cut on the pad of his foot! The pad has just started to swell and turn red. Hubby and I cleaned the foot and sprayed it with antibiotic. 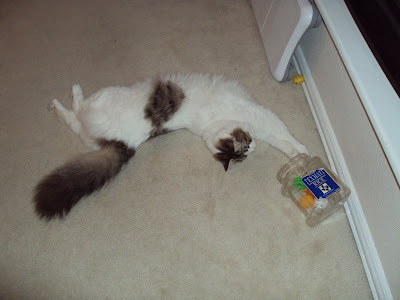 Tonight we will begin tearing the house apart trying to figure out just what Skor is getting into which cuts his feet. Doesn't that sound like fun? Voice Update: The left side of my neck is still sore - so sore in fact, that when Susan gave me my massage yesterday, it was all I could do to keep from crying out. Not good folks, not good! At least my speaking voice is still rocking! While I was working yesterday (okay, it was really while I was on a break), I was leafing through a catalog about shoes. Imagine my surprise when I found this . . .
Are these not the most adorable hats? I just had to chuckle and show everyone in the office. 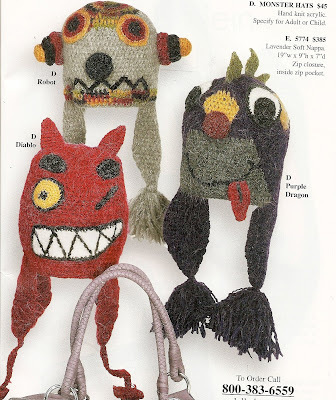 Then I thought about my Aunt Donna - she knits all kinds of stuff. I think she would like to knit these hats for her grand kids. And maybe one for me too! I just adore the dragon's little tongue sticking out! Miss Cleo Update: I think she has accepted her plight and has decided to act dignified even though she looks hysterical in her little polo shirt! Voice Update: Doing well but I have a horribly sore spot on the left side of my neck. I got a massage from Maria yesterday - it was nice. My actual voice is doing okay - I am really stepping up my exercises in an effort to keep it that way and to get rid of that sore spot! Bountiful Harvest . . . Happy Tuesday! We all survived Monday and are back for another day! Actually, yesterday went very well for me. I started a new work schedule so that I will be ready when I begin my class next week. I will be taking ASL 4 on Monday and Wednesday nights and need to leave work a bit earlier on those days to make it to school in time to do some lab work. Anyway - I test drove the new routine yesterday and it seemed to work well. The only flaw is that Hubby didn't realize I was doing it and wasn't home when I came home - early - yesterday! How did I get home early? Remember, I test drove the routine but there wasn't really a class so . . . home early! 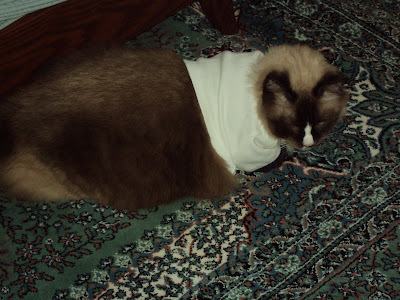 Miss Cleo Update: Well, I think Miss Cleo has finally accepted the whole "shirt" thing. She hasn't taken it off for an entire day! She is even walking a bit more and not looking quite so upset with me. Progress! The main topic for today . 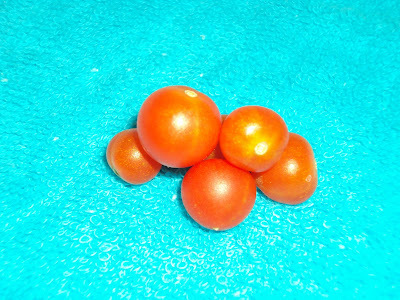 . . my harvest from my tomato plants! 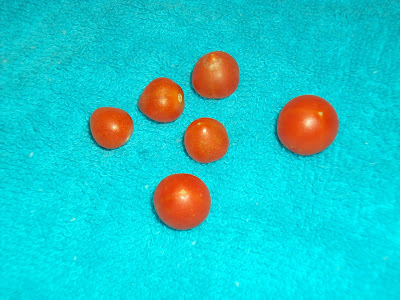 Six lovely, red tomatoes! Don't they look yummy? There is just a little weird thing about these tomatoes though. Do you notice it? Look at the picture above closely. Yes, a few are a bit pointy but that isn't it. Go on - look closer - do you see it? What? You don't? Well, Maybe I can help you out a bit by showing you this next picture. Do you see it now? These tomatoes are TINY! Almost miniature! All six of them combined are still not as big as one golf ball! Hubby laughed when I brought in this bounty! 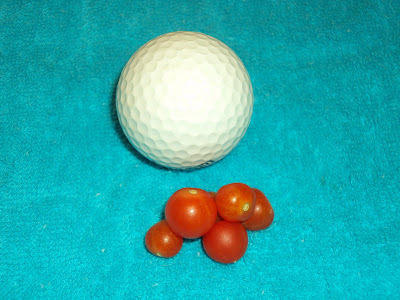 There are other, bigger, tomatoes - still green - on the plants but, all that were ripe were tiny, small, minuscule! But - they are still tomatoes, right? Voice Update: Well, my voice took a bit of a beating yesterday despite the fact that I wasn't on the phone too much. I don't know exactly what happened. When Susan gave me a massage, my neck was tight and sore! Nuts! Some of you might have guessed that my cat, Skor, is a bit inquisitive. This leads to all kinds of trouble. He has cut his feet twice on things which Hubby and I have never identified. He gets locked into closets when he sneaks in without us noticing. He knocks all kinds of stuff off of low shelves and "hides" things we are looking for (can you say car keys? He made me late for work on Thursday!). Skor's inquisitiveness does have its upside - it does keep him entertained. Sometimes it keeps him busy for quite a long time. Yesterday, Hubby and I were watching Big Brother (yes, we are addicted!) and Skor . . . well, he was keeping busy. We put all of his balls in a box about once a week to keep them from underfoot. He spends the rest of the week digging them out. Of course, the goal is to dig them out - not to play with them! 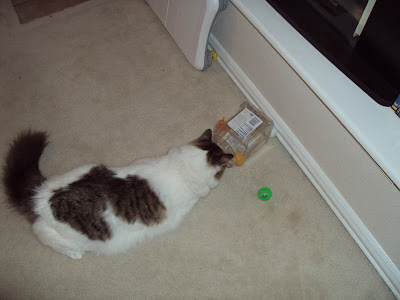 See how he ignores the green ball in his quest to get the orange ball out of the box? Sometimes he takes a moment to study his task. Then he throws himself into the task whole-hearted. Hubby loves it when he gets his head in the box (don't worry - he can get out and can breathe!). Here is a video of Skor's entertainment. Enjoy! Miss Cleo Update: Still has the shirt on even though it becomes a "tube top" when we get up in the morning. She gets her legs out of the sleeves even when we tape them so they are tighter. Then she has the shirt stuck around her belly. The good news is that it doesn't look like she has been bothering the stitches too much! Voice Update: Still doing well. In fact, last night I was running through all of my most difficult sounds for Hubby and I didn't have a single break or skip! YEAH! Of course, this is just the beginning of the work week so - we will see how the voice lasts! I thought I would show you the project I have been working on for the church. It is a holiday ornament called a Chrismon. 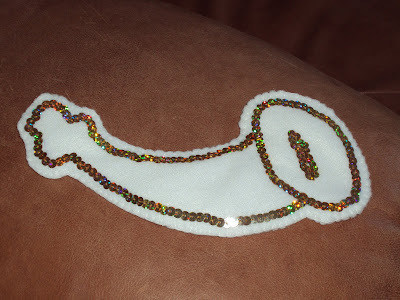 This one is in the shape of a trumpet or horn. I finally finished sewing it on Saturday! Yeah! Not too bad, right? Please tell me it looks good even if you don't think it does - it took me a long time to decipher the instructions which came with this thing! As you might know, Miss Cleo went to get her teeth cleaned on Friday. While there they found that she also had a tumor on her right shoulder. They removed it and sent it to a pathologist so we will know soon just what it is. Anyway - when she got home she was really, really hungry. The only problem was that her teeth hurt and she was really loopy. I dug some salmon out for her and put it on a plate. It is on the carpet because she was sliding all over the tile floor. 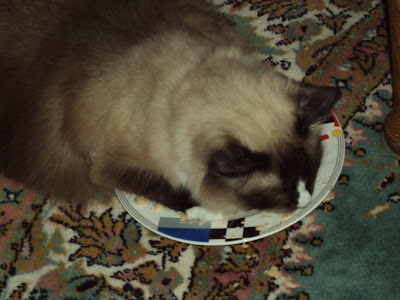 Eventually, Miss Cleo gave up trying to remain upright and just laid down right on the plate. These pictures don't really show how funny this was but . . .
Miss Cleo really tried to eat but ended up pushing a lot of the salmon off the plate and then spent some time looking for it. For the first couple of days, Miss Cleo was good and left the stitches alone. Then . . . this morning I was up and noticed that she had some dried blood around the incision which wasn't there yesterday. Then I saw her yank the heck out of one of the stitches. Don't you think that would hurt? Well, I decided that she might need to be coned. I pulled our Skor's cone and put it in place. Miss Cleo went absolutely nuts. She ran into walls and furniture, rolled on the ground trying to paw the cone off, she was doing stuff that made me worry that she was going to hurt herself. Obviously I needed another plan. It is difficult to see in this picture but Miss Cleo is sporting an infant's white polo shirt with blue trim on the sleeves and collar. This is a shirt which my teddy bear, Bearsy, usually sports but it seemed like it might serve the purpose. 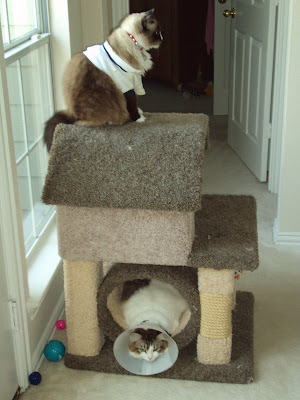 Let's just say that Miss Cleo isn't too happy about her fashion statement. At first, she wouldn't even get up. She acted like the shirt was impeding her ability to stand and walk. Then, she got up but walked like something horrible had happened to her. I think she is finally starting to get used to the shirt. I did notice that she managed to get her leg out of the sleeve - on the side of her stitches, of course. I buttoned the collar in the hopes that she won't have enough room to do that again. What problems we have! I must say that it does break my heart to have to do this to my little girl! Voice Update: Doing okay. Still needs some rest. When I posted about Dystonia yesterday I realized that I was actually jealous of the amount of research there is going on about Dystonia. Jealous! Not good, not good! Especially since I just listened to a devotional about how jealousy is sinful! I will work my way through it! It is Saturday and today I have all the time I want/need to write my blog and to read other blogs! Heaven! Yesterday, Miss Cleo got her teeth cleaned. She also had a small tumor removed from her right front shoulder. I am happy to report that she is doing well. She was VERY loopy yesterday when I picked her up. She would walk and stumble and fall over. Not too much fun to watch. 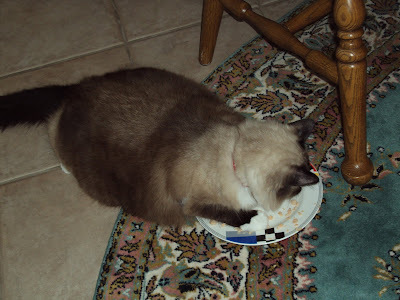 She was also very hungry but couldn't do the dry food - which is all we feed our cats. I pulled out some salmon and she feasted the best she could. At one point she just laid down on top of the plate and licked up what she could reach. Poor Miss Cleo! Today she is better - more stable. I just gave her some pain meds which I hope don't make her as loopy as she was last night. For the record - it was easier giving her meds than Skor. On to today's "real" topic. As I am sure you know (and are probably tired of hearing), I have Spasmodic Dysphonia. Abductor Spasmodic Dysphonia to be exact. This is a neurological disorder which causes the muscles controlling the vocal cords to spasm uncontrollably. This, of course, makes speaking pretty much impossible. Well, Spasmodic Dysphonia (SD) is a focalized form of Dystonia. Dystonia is basically the same neurological disorder but affecting other parts of the body. Most people with Dystonia have Cervical Dystonia which is the neck and shoulders. The dystonia is so bad that people end up literally twisted by the spasms. It is heartbreaking to see people all twisted AND dystonia is generally very, very painful (SD is generally painless). Anyway, my main point is that Dystonia and SD are related. Because of that, many people with SD are also very involved in Dystonia awareness. In fact, many people with SD also have Dystonia somewhere in their bodies. 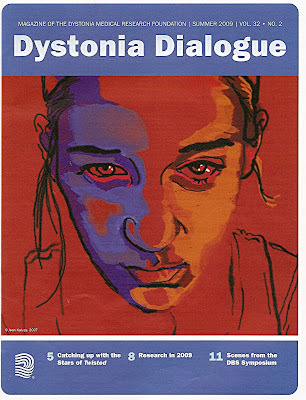 My speech pathologist gets this magazine which is put out by the Dystonia Medical Research Foundation. Working for Susan allows to me read this magazine (with her permission of course!). So - I brought it home this weekend to read it. I came to a couple conclusions while reading and I would like to share them with you. First - God bless all people with Dystonia. It is a terrible disorder that is often very painful. Second - thank God for the scientists who research Dystonia. They have found several ways to manage the disorder - including Deep Brain Stimulation (DBS). DBS is where electrodes are placed in the brain in the areas where the spasms originate and then hooking the electrodes to batteries. The electrodes then send out electrical currents which basically disrupt the signals being sent by the brain to cause spasms. Most people I have read about with DBS are able to lead relatively normal lives after the implantation. Third - there are a mess of studies about dystonia currently underway. In fact, I counted 18 listed in the magazine. With that much research going on there will surely be a cure found soon! Fourth - a gene has been identified which is believed to be responsible for early onset generalized dystonia. Fifth - dystonia is being researched using animal models. Sixth - there was no mention of SD in the entire magazine. At first, this bugged me until I realized why. SD is very localized. Plus, there is no way to use animal models to study SD since humans are the only animals who speak the way we do. True, other animals have the capacity to speak (parrots, etc) but, they don't utilize their voices like humans so they can't be a good model for SD. No gene has been located which is thought to be responsible for SD. DBS isn't even considered for people with SD (as far as I know). All of this sort of makes me feel like SD is the ugly stepsister in this process. Sure, it is hanging around but, it takes a back seat in pretty much everything. Now, I am NOT saying that research for dystonia should take a back seat to SD. I honestly think the research being done for dystonia is wonderful and needed since the disorder causes such pain. However, it would be nice to see just a little more done about SD. SD is a real pain in the rear to live with. Sometimes I look at people with Dystonia and think, "At least they can talk!" Then I realize that I am being foolish. Yes, these people can talk but they are physically "twisted" and in pain. Their plight is worse than mine. People must think that they are mentally deficient also because of their physical problems. God bless them all! Voice Update: A bit tired from the week but doing well. I have done my inhalation exercises and massage. I am sure that I could do a bunch more (Which I will try to do) but at least I am working on it! Am I a Bad Kitty Mom? This morning I had to get Miss Cleo to the vet's office so she can have her teeth cleaned. This is something we do every couple of years. This year it was especially important because she has a swollen area in the gum around her right canine (the long pointy tooth she uses to snaggle us!). We want to get that cleaned so we don't have any problems with her gums. Hopefully, that tooth won't have to be removed! Taking Miss Cleo to have her teeth cleaned meant that she couldn't eat after 10:00 P.M. last night. THAT meant that Skor couldn't eat either. Of course THAT meant that both kitties were very hungry in the morning and decided that 4:15 was an appropriate time to wake me up asking for food - which I couldn't give to them! I laid in bed, awake with two kitties pestering me, until Hubby got up and got into the kitchen. Then the kitties went with him hoping he would succumb to their big, kitty eyes and give them food. He was strong. I was proud of him! However, when I stumbled out of bed to walk, I was greeted with this. 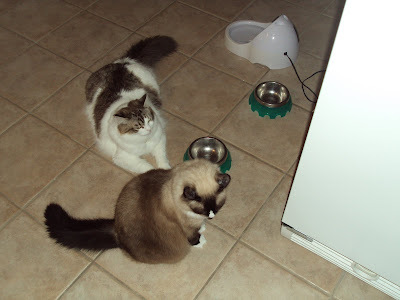 Two kitties just sitting by the empty food bowls alternatively whining and peering up at me hopefully. Eventually, they decided to just take up residence by the bowls. They would settle in for a while and then try the whining bit again. 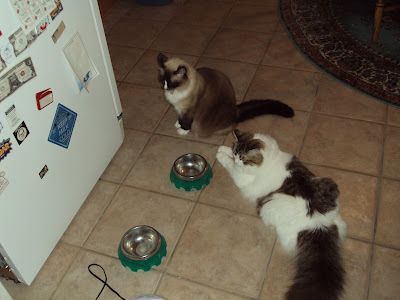 Any time either Hubby or I walked near them, both cats would jump up and wind through our legs whining for food. Heartbreaking! Talk about being made to feel like a bad kitty Mom! The only thing worse was when I actually had Miss Cleo in her carrier and in the car. The heart wrenching meows coming from that little carrier were soooo sad! It does help a bit to know that when I go to pick her up from the vet's this afternoon she will completely ignore me for at least an hour as revenge. Voice Update: I don't really know. I am so darn tired that everything is sort of warped in my brain right now. I do know that I DO have a voice - I have talked to the vet and Jay this morning. I don't know what the quality is exactly but . . . when I get up from my nap I will do my exercises and massage. As you might know, I have been working for my speech therapist for the past 7 weeks. That job isn't over yet but I thought it was time to show you my working space. I took these pictures yesterday - primarily to show my mom so she can imagine where I am working. 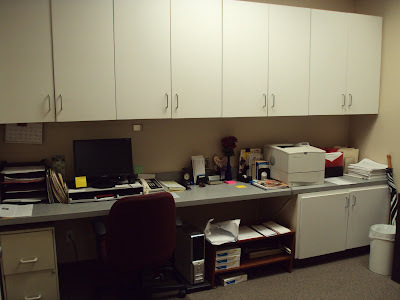 This is my office - there is under cabinet lighting which isn't on in this picture. It really makes things MUCH brighter. Mom said that this is a messy room. I don't know - there is a lot going on but I think it is pretty neat. What do you think? 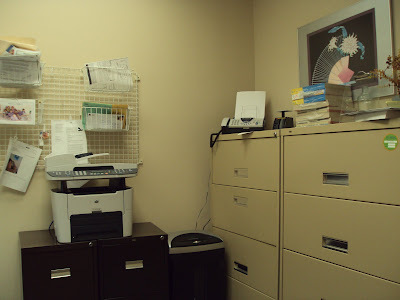 Next is another view of my office - this is to the right of the first view and shows the back of my office - lined with file cabinets. The fax machine - on the corner of the cabinets - is a bit too high for me to read the screen so I employ that stack of phone books you see - as a stool! Doesn't this look like a fun place? It is actually a pretty nice place to work. All four of the therapists are nice people - VERY different but nice! - and they do care about how I am doing with my voice every day. If this was my office for the rest of my life - I might rearrange a bit but - I am only a temp here so . . .
Voice Update: I have spent a LOT of time on the phone lately and my voice shows it. I am having a bit of skipping on those blasted unvoiced consonants (especially h and hard c's). Luckily Susan gave me TWO massaged yesterday. That should help combat the fatigue! This morning didn't start too well for me. Skor decided that I needed to get up at 5:30 A.M. - an entire hour before I normally get up! Then, when I finally did get up, I walked out into the kitchen and saw this . . . Call the National Guard! 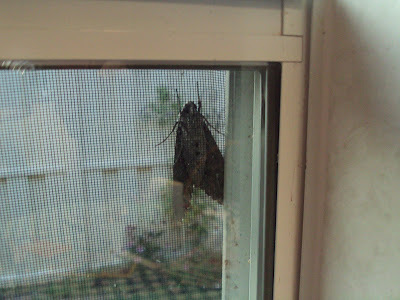 We are being attacked by Mothra! 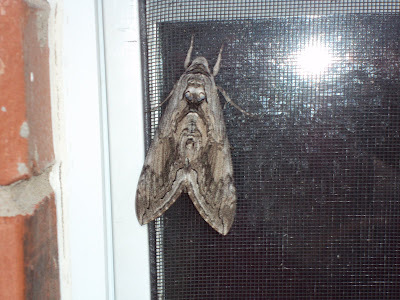 Of course I grabbed my trusty camera and headed outside to take a picture of this HUGE thing on our window. 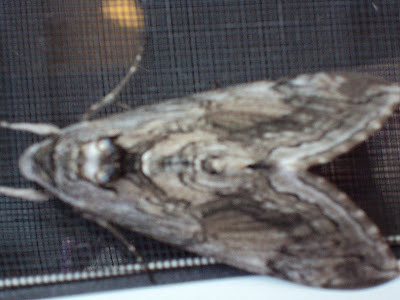 It was such a masterpiece of camouflage that my camera had a hard time focusing on it. And did I mention that it was HUGE? I made sure that the bricks were in this picture to try to let you gauge the size of this insect. 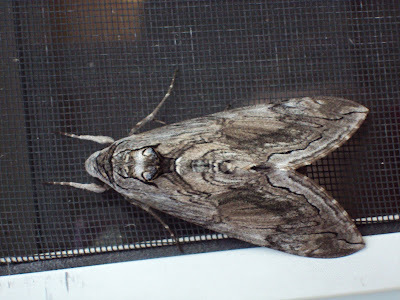 Before going outside, I told Hubby that I was surprised that Skor hadn't found this bug yet. When I got back inside . . .
Poor Skor - always trying to get things that he can't have! After this it was time to meet my neighbor, C, to walk. By the time I got home, the moth was gone. 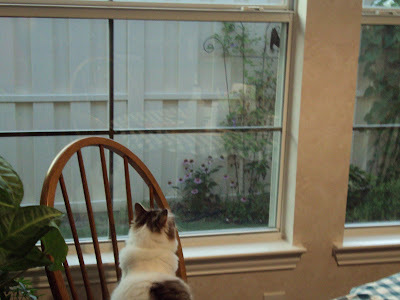 I don't know if it flew away or if one of the birds at our feeder right by that window got it. If a bird got that huge thing - I am impressed! That is my news for the day! Now I am off to my blog archives to see if I blogged about The Wedding Singer, the Musical. Hubby insists that he didn't go to see it with me and I am pretty darn sure that he did! Voice Update: I was on the phone ALL DAY at work yesterday. Today my voice is showing it. I am still sounding pretty good but I can tell that my voice is a bit tired. Poor voice! I am sitting here listening to my iTunes shuffling my songs for me and I am pleasantly surprised each and every time a Christmas song comes up. It is interesting how much more meaningful they are when you don't hear a whole bunch of them clumped together - or hear them constantly in the stores! Hearing the Holiday music made me think about how our society focuses most of our charitable giving around holidays. It is so natural to give to charities during the "happiest time of the year" but, what about those other times? 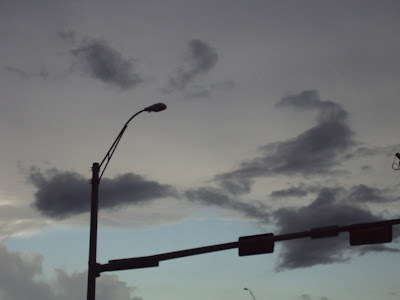 The times that might not be so happy - like the "dog days of summer" or the rainy season of spring? What about that time when all of the kids are going back to school? These are all times when people who are struggling would really appreciate a little extra help. I think that radio stations should play a Christmas song every once in a while to remind us all that we can be giving at all times of the year - not just at Christmas. Maybe if we hear that music about cheerfulness and happiness we will feel moved to donate more all year round. Voice Update: Got a nice massage from Susan yesterday at work. Things are going pretty well. It is August and I should be planning another meeting for the support group but . . . I am being lazy! Plus - I don't want the hassle of trying to find a location. Should I get on the ball with this or just let it pass???? My Weekend and Phineas Gage. I hope everyone had a very wonderful weekend and is ready for another great week this fine Monday! After my "stream of consciousness" post I think I can focus for a simpler post today . . . I hope. My weekend was very nice - restful and peaceful. Hubby and I went to Sam's club on Saturday to get his contacts (much cheaper than other places he could get them). Of course we had to "shop" the entire place. We ended up with several things (a book for me "slipped" into the cart!) which we needed and even some we didn't know that we needed. You know how that goes! Prior to our shopping we had a nice dinner at Boston Market. I tried their new crispy country chicken - it was okay but not my favorite. Their meatloaf is still at the top of my list! It is always fun to go to Sam's. They have so many different things to look at! Yesterday Hubby and I went grocery shopping - together! It has been a long time since we went to the grocery store together. It was nice to have help getting stuff into the car and then out of the car and into the house! This weekend I also spent some time up in the bonus room where my sewing machine is and where the computer I use to play with my music is. I hemmed one t-shirt I got while on my cruise and put bias tape trim around the neck and sleeves. I had made the bias tape a couple of days ago and finally got it onto the shirt! Yeah! I still have a couple more shirts to hem but - one baby step at a time, right? And then - I read a book on Phineas Gage. Phineas Gage was a man who worked for a railroad company in the mid 1800s blasting to clear a route for new tracks. He was blasting and the black powder he was using accidentally went off and shot his tamping iron through his head. Yes, you read that correctly - through his head. AND Phineas not only didn't die - he was walking around and talking minutes after the accident! His head healed and he seemed "fine." Except for the fact that he was a "different person" because the accident destroyed part of his frontal lobe - which controls personality. Phineas and his accident helped advance the knowledge doctors have about the workings of the brain. It is very fascinating - and somewhat gruesome reading. If you have never heard of dear, old Phineas, you might want to Google him - there is a lot of info on him on the web - plus some pictures which make you thankful that you don't work blasting for a railroad! Voice Update: Still doing pretty well. I didn't do as much exercising as I should have this weekend because my back was bothering me. Apparently, I can only take care of one thing at a time! There are just days where I can't focus my thoughts on one particular topic to post. Usually I sit and think until I decide which train of thought I should blog about. Today - I think I will let you take a little peek into what is going on inside my brain . . . sort of a stream of consciousness kind of thing. I want to blog about something other people will find interesting so that I get some comments. But then again - do I really blog for comments? Or do I blog for myself? There are some things I could blog about but I don't want to since that would reveal just a little bit too much about me to everyone. I am not sure I want readers to know THAT much about me! I could blog about my cats - but I do that too much already. Besides, who would really be interested in hearing that Skor can't leave me alone to blog and has to jump up on the desk and lay down right in front of me - sometimes on the keyboard so there is no way that I can type. I could post what ends up on the screen when Skor is wandering around the keyboard - but that would just be annoying! Of course, I am sure that there are others out there who know how wonderful it is to have a purring kitty nearby. They are so darn cute when they purr. They get all floppy - their little cat paws are limp and they just are blissed out. Oh - to be a cat! But - I suppose I should blog about more serious things. Like the conflict I feel right now about "what I want to do when I grow up!" I am getting to the time where I am going to have to make some decisions. Work- with the speech therapists - is good but I just don't know if that is what I want to do with my life. It is good money and is only four half days a week so maybe I should take it. But then does that mean I am giving up on teaching? And do I really want to go back to teaching with all of its hassles and stresses? I am so worried that my voice won't be able to handle it and I will be forced to quit mid-year for the second time in my teaching career. What would that say about my reliability? If I did that would I ever be able to get another teaching job in the future? Would I even want one? I sort of like the idea of teaching Deaf children. But - would that be more hassle than it is worth? The only place where they have those programs in the area are either in Dallas - not a really palatable choice - or Irving - which is far from home. Gee - my back hurts. I wonder if it is just stress about trying to make decisions or if something is off with my work set up like the chair or computer or something. Mysterious! Right now Christmas music is playing on my iTunes. I have it on shuffle - like always - and just recently decided to put the Christmas stuff into the mix. It is sort of nice to hear it mixed in with other genres of music instead of just with all Christmas music. Hmmmm did saying Christmas that many times offend any of my readers? I suppose it would be more "politically correct" to say "holiday music." But too bad - I happen to believe in Christ and think that this whole political correctness stuff has just gone way, way, way too far! So there! I will listen to my Christmas music all I want! Speaking of Christian things (well, in a way) I have found some neat podcasts for my daily walks including a couple daily devotionals and a bible in a year podcast. I had put them on my iPod a couple days ago but didn't get to listen to them because my neighbor, C, walked with me and listening to my iPod while walking with her would be rude. Has anyone tried the Pizza hut pizza rolls? They show them on the commercials and they look great but . . . we haven't gotten to Pizza Hut to check them out. I had hoped to go today but Hubby made pizza last night (Digiorno) at home so that is out. Not that I couldn't eat pizza every day of the week but Hubby is a bit more particular! Skor is hanging over the side of the desk right now with part of his body laying on my hands while I type. So adorable! I guess I will stop for now. I hope no one got lost on the edited version of my thoughts. I promise to think of something more . .. concise for tomorrow's post! Voice Update: Doing well. I don't want to talk about it though. Just feeling sort of grumpy! My Blogging Bane - Breakfast Out! Sorry I didn't post anything yesterday but . . . I had breakfast out with my ASL friends. Having breakfast before working meant that I had a choice - skip walking to blog or skip blogging. As you can tell - I skipped blogging. I am trying SOOOO hard to keep up the walking as a daily thing. Plus, my neighbor, C, walked with me so I couldn't walk, now, could I? Okay - breakfast. There is a small, core group of women from my ASL 4 class and my Deaf Culture class that like getting together to socialize and practice our signing. We go to a Deaf church every once in a while. It is fun. We all like each other and our personalities seem to mesh well. Yesterday we went to La Madeline's. In case you don't know it - it is a French style bistro/cafe which serves incredible fresh foods like crepes, omelets, breakfast croissants, quiche, etc. along with a selection of soups, salads, and fruit. They also just happen to have excellent pastries as well - the fruit tart is my personal favorite. We all sat around a table and chatted (in both English and ASL) and had fun meeting S's friend, B. B is Deaf and is from Houston so he was just in town visiting S. It is always fun to meet Deaf people and to find out that they are just like us except that they speak a different language! B was very interesting and fun to be around. My friend - the "other Tricia" - brought her two kiddos who were very nice young boys. They were a bit shy at first but really livened up to blow straw wrappers at us. I have to say it was fun to be a bit childlike with the straws! After breakfast I had to leave for work so I don't really know how long everyone else stayed and chatted. *sigh* getting together with friends is so wonderful and recharging for the soul! Oh - a side note about another friend, J, whose husband left her. She recently found out that her husband has been spending a lot of money on a psychic. Pray for her folks, pray for her! Voice Update: Doing well but I need to get in some more exercises. It is so hard with work! I admit it. Over the weekend I had a major blonde moment. So did Hubby. So did several hundred other people. All at the same time. How, you might be asking yourself? We all went to the Music Hall to see Legally Blonde, the musical! Having long been fans of the movie version of this production, Hubby (who only grudgingly admits to enjoying the movie) and I knew what we were in for - sort of. We knew the story line and the characters and we also knew that this wouldn't be a heavy-weight musical. It would be far fluffier and cute. While we were right - the musical was fluffy and cute - we (okay, maybe it was only me who was impressed - Hubby won't comment) were impressed by the fun and humor the musical brought to the stage. While many of the songs were a bit "cheesy" such as "Omigod You Guys," "Bend and Snap," and "The Harvard Variations," there were many songs which fit into the plot line very well and brought just the right touch of serious emotion to the musical. These included "Blood in the Water," "Ireland," and "Legally Blonde." The addition of two adorable trained dogs - one a chihuahua for Elle and the other a bulldog for Paulette - spiced things up even though the dogs weren't on stage very long compared to their appearance time in the movie. Another stand-out performance was given by Natalie Joy Johnson, the actress who played Paulette. In this incarnation, Paulette is a hair stylist instead of a nail tech and she dreams of going to Ireland where everything is better (a big play on the whole "the grass is greener" metaphor perhaps?). Johnson blew me away with her strong voice and the emotion she brought to her songs. She was certainly a highlight of the performance. The other actors were good - in particular Ken Land who played Professor Callahan - and everyone gave very enthusiastic performances. The dancing was well choreographed and performed and the sets were just colorful enough to add to the glitz of the show without stealing the scene. The plot followed the plot of the movie for the most part with some minor changes and the musical as a whole was fun, upbeat, and cheery. If Legally Blonde comes to your town, I wouldn't hesitate to take your family even thought Hubby would like for me to relay that there was a notable lack of men in the audience when compared to the pink clad women and girls. Of well - grab something pink and head to the theater. 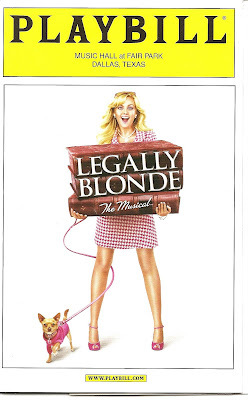 Legally Blonde will deliver a fun time without making you think too hard about the plot. It will also leave you with fun melodies running around your head as you leave the theater. Just what a musical should do! Voice Update: Doing well. Enough said. When I started my little garden in my side yard I had several motives. First - nothing grew in that area anyways - at least in terms of grass - so it was a blank canvas. Next, it was near the bird feeder and I hoped to plant some bird friendly plants to enhance the area. Then I hoped to encourage some hummingbirds to stop by (still not doing too well with that yet!). Finally, I hoped to get some butterflies to the area. Well - some of my goals have been met. 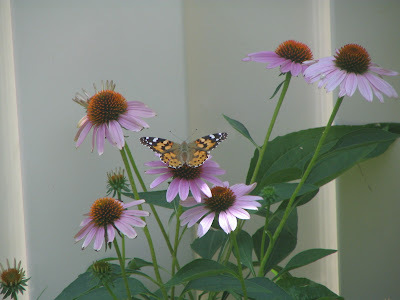 The other day I was in the kitchen and I saw this butterfly making the rounds of the Cone Flowers. I grabbed my camera and took some shots through the window. Not the makings for the best picture but, I think I did okay! What do you think? This post is going to be super short because I wasted too much time on Facebook this morning and I need to go grocery shopping before heading to work. That means I need to shower and get dressed and all of that good stuff too! No wonder I feel like I don't have enough time! Voice Update: I got a nice massage yesterday and am doing well! Yeah! I have new shoes! Okay - so I bought them during my cruise but you know how slow I am being about posting cruise photos so . . . While at the airport - I think it was in Albuquerque, New Mexico - I happened to see a Croc's store. That is right - a genuine Croc store. 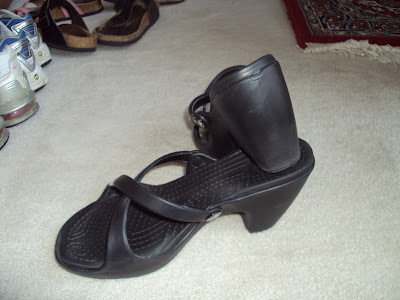 I had heard that they had heels so I was curious. We had the time so - I tried some on. They are comfortable! They had two different styles at the store that I liked but here is what I ended up getting . . . I have the pictures in the reverse order that I intended but, I guess it will work! The bottoms have good traction. They have a fair sized heel. Another shot to show the heel height. They are strappy and fun and comfy. What more can you ask from a shoe? I love them! In fact, I am thinking I might go online and buy the other style in a different color. 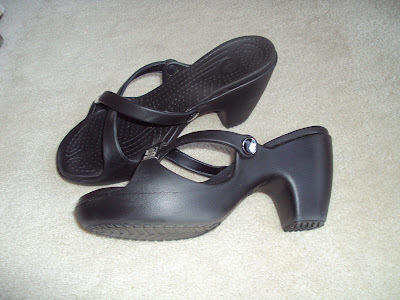 I might have to do it quickly because I heard on the news just the other day that the Croc company isn't doing too well! Yikes! Just when I found fun heels which are comfortable! Isn't that just my luck! Voice Update: Doing pretty well. I am certainly looking forward to getting a massage today though!